Large Laundry Bag with a personalised name or brief message and the option to have a motif added. Large Laundry Bag with a personalised name or brief message and the option to have a motif added. A tidy storage solution for around the house and handy for taking clothes to be laundered. Embroidered with a name or brief message in a letter font style and thread colour of your choice. Embroidered with a name or brief message in a letter font style and thread colour of your choice. You can choose yes to add a motif and select a design from the green link in the options section. Sturdy natural cotton canvas drawstring sack. The giant sack is very good quality and measures 60cm wide by 76cm in height and will hold plenty of clothes. 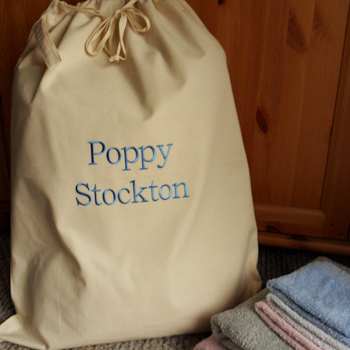 Personalised laundry sack can also be used as a toy storage sack or even a birthday present sack! Please note: Made to order in the UK. Personalised gifts are usually shipped out within 48 hours.